Ants often come in large colonies, and they can sure be a pain to get rid of once they decide where they want to set up their colony. Being the most common pest that homeowners and businesses see, it is no wonder that our pest control services are used so often to exterminate ants in buildings. Walnut Creek Pest Control is here to help. Ant colonies can range up to a few tens of ants up to hundreds, thousands, and even millions depending on how out of hand the situation gets. 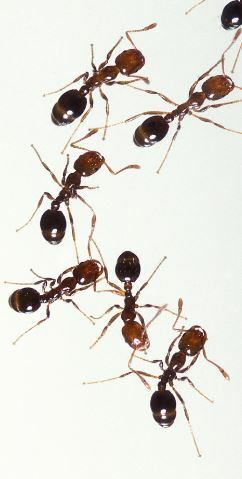 Each colony has at least one egg laying queen, sometimes more, worker ants, and soldiers ants. Some ants can also have wings, which help quickly take them to a new area to make another nest. Flying ants may not always be exactly that, and sometimes it could be another insect, but, yes, there are some ants that fly. And if you are dealing with these, more than likely there is a huge colony of ants nearby. There are some ants that can cause major damage to structures. If there is a colony of carpenter ants, this could be a serious threat to the structural support of your home or your businesses. Some ants like carpenter ants can chew through wood ruining a structure. 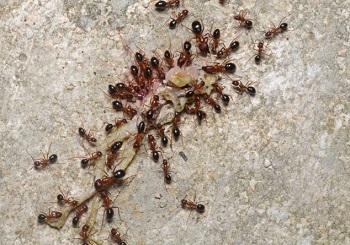 Take these ants out as soon as possible before they cause thousands of dollars worth of damage. Without a large enough colony, ants can wreak havoc, and you will wish you would have called an ant extermination company in for pest control earlier. Whatever kind of ants you have, whether it be regular ants, carpenter ants, fire ants, flying ants, or white ants, Walnut Creek Pest Control has the tools for your insect extermination. Ants are attracted to anything and everything, It can be some sugary like fruit, or disgusting like a pile of poop. It is important to be as hygienic in your home as possible to prevent the uprising of a colony of ants. The main reason ants are coming into your home or business is to look for food, if you have some readily available for them to take back to the colony, more and more may start to come in and help themselves. Our pest specialists are well aware of the state of the planet, that is why we take every precaution and use environmentally friendly treatments to help curb your pest problem. Green treatment and repellents are the future, and we want to be your choice to call.